In recognition of our rigorous standards, quality control, and management processes, our logistics and integration centers now hold ISO certifications, nationwide. Zones delivers complex IT solutions. Simply. But our solutions don't end at the point of sale. 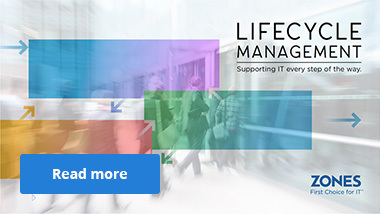 See what our Lifecycle Management Services have to offer below. 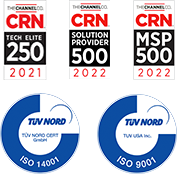 Our four Solution Environments – Workplace Modernization, Network Optimization, Data Center Transformation, and Security Fortification – encompass a variety of supporting services. And we can help you identify, acquire, and deploy the right solution for the job – quickly and easily. Our teams of integration specialists are certified to build customized IT solutions that are unique to any business need. We offer a wide range of staging, configuration, IMAC, and ITAD services, all of which can free up your IT team and save you valuable time. Just leave it to the professionals in our Technology Innovation Centers to pack, rack, and track your precious cargo from the point of origin all the way to its final destination. Give us a call at 800.408.9663 to learn how we can start serving you today. Our dedicated project managers will work directly with you on every project to ensure that your IT deployments are completed within budget, in scope, and on schedule. Post-deployment, our support team will handle any service requests, event notifications, or reactive issues that come up – allowing you to keep all of your operations running smoothly. Designing, implementing, and supporting large projects can be a very complicated process. Fortunately, our purpose-built Zones nterprise platform simplifies the entire process and provides total transparency at every stage. Our Technology Innovation Centers are strategically placed in locations that allow us to expedite deliveries. And the IT configuration, logistics, and implementation experts at each of them ensure smooth rollouts of complex deployments. Our network of affiliates and service providers extends even further, letting us configure and ship to over 80 countries around the world.